Growing up, I remember The Oprah Winfrey Show on every afternoon at 4 pm in our home. My mom loved Oprah, and so did I. I dreamed of meeting Oprah and being on her show (because I thought I would someday be an actress – ha!). As I got older, I read Oprah recommended books, subscribed to her magazine (I still have the first issue) and learned a lot from her. Now, as an adult, I have been inspired by her Super Soul Sundays and the way she lives with intention, gratitude and generosity. Without question, she has had a profound influence of my life. When I was 20 years old, I set my internet homepage to The Oprah Winfrey Show’s last minute ticket page. Every day I would try to get tickets. One lucky day, I got them! A few days later, on a cold February day, my friend Marissa and I drove to Chicago and went to HARPO Studios for The Oprah Winfrey Show. I was SO excited. When we got to the front of the line, I was a bubbly, joyous mess. The kind employee saw that excitement and put us in THE FRONT ROW. Needless to say, we were over the moon. I have tried to find the episode on YouTube, but couldn’t. Though we didn’t meet Oprah that day, it was exciting being in the audience and experiencing something so iconic for our generation. The show we saw taped was Oprah’s 50th Birthday recap. Remember how it amazing her birthday was? Upon leaving, the audience was given gift bags of the leftover goodies from Oprah’s celebration – XL pajamas, socks and a journal. I still have all of it. I wore the PJs for each of my pregnancies. I don’t think I will ever be able to get rid of them. Then, when my book The Fringe Hours released, I was interviewed for O Magazine. To say it was a thrill seeing my book in the pages of a magazine I’ve loved since its inception is putting it mildly. Oprah’s words and actions have deeply touched my life. And now, nearly 15 years after that show experience, the dream I had as a little girl is coming true. I am going to meet Oprah. I’m tearing up writing this blog post. It might sound silly, but this feels like God is whispering in my ear, saying, I’ve seen you. I always have. I know those dreams inside you. I know what this means. I never thought I would be able to top that excitement I felt as a college student going to The Oprah Winfrey Show, but receiving an invitation from Disney/ABC to attend the A Wrinkle in Time premiere and interview the cast did me in. This Saturday, courtesy of Disney/ABC I will fly to LA for a four-day press event. Saturday evening we will screen A Wrinkle in Time, which is “an epic adventure based on Madeleine L’Engle’s timeless classic which takes audiences across dimensions of time and space, examining the nature of darkness versus light and, ultimately, the triumph of love. Through one girl’s transformative journey led by three celestial guides, we discover that strength comes from embracing one’s individuality and that the best way to triumph over fear is to travel by one’s own light.” See the trailer below. We will have the opportunity to ask questions and get a group photo after each interview. I am so overwhelmed that I still haven’t selected my best questions. What would you ask? Monday evening we will attend the movie’s red carpet premiere. If you follow me on Instagram, you have seen all my dress shopping challenges. I finally have the dress altered, shoes and jewelry bought and am ready to go. It is SOOOO pretty. I can’t wait to share pictures from the event. 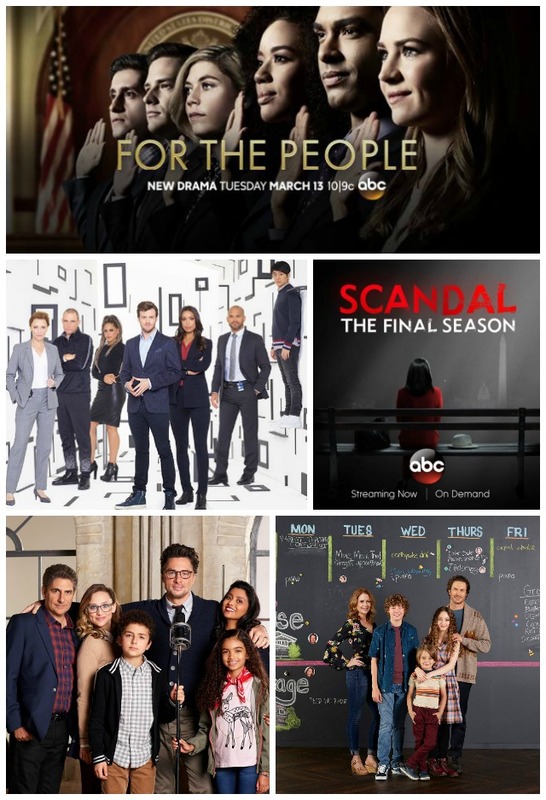 In addition to attending the red carpet for A Wrinkle in Time and interviewing some of the cast, our group will also be screening four new ABC shows: Deception, Alex, Inc., Splitting Up Together and For the People (above photos courtesy of ABC). Over the course of the next few weeks, in exchange for attending the press event, I will be sharing my thoughts on the shows and experiences meeting some of the cast members. You will also be able to follow real time on Instagram stories. Below I have posted the press information we were provided about each show. If any of them look especially interesting to you, I’d love to know, as well as if you have any questions. Of all the shows, For the People is the one that piqued my interest the most. I have always enjoyed legal shows. When his career is ruined by scandal, superstar magician Cameron Black has only one place to turn to practice his art of deception, influence and illusion – the FBI. Using every trick in the book and inventing new ones, he will help the government catch the world’s most elusive criminals while staging the biggest illusions of his career. “Deception” stars Jack Cutmore-Scott as Cameron Black, Ilfenesh Hadera as Kay Daniels, Lenora Crichlow as Dina Clark, Amaury Nolasco as Mike Alvarez, Justin Chon as Jordan Kwon, Laila Robins as FBI Agent Deakins and Vinnie Jones as Gunter Gustafsen. The show will premiere Sunday, March 11 after the premiere of American Idol. Based on the podcast StartUp, Alex Schuman (Zach Braff, “Scrubs”) is a brilliant radio journalist, husband and father of two who is about to do something crazy – quit his job and start his own company. He quickly discovers it’s going to be a lot harder than he thought. Zach Braff stars, directs and is executive producer with Matt Tarses (“Scrubs”) and Davis Entertainment (“Dr. Ken,” “Blacklist”). “Alex, Inc.” premieres on Wednesday, March 28th at 8:30/7:30c. Based on the Danish series, “Splitting Up Together” is the story of a couple (Jenna Fischer, “The Office,” and Oliver Hudson, “Scream Queens”) whose marriage is reignited by their divorce. Emily Kapnek (“Suburgatory”) writes and serves as executive producer of this new comedy, along with Ellen DeGeneres. Splitting Up Together premieres Tues 3/27 at 9:30|8:30c after the premiere of “Roseanne”. Thank you for joining me for this exciting, once-in-a-lifetime trip! My heart is so full and I am so grateful to share it with each of you. Congratulations Jessica! That is SO EXCITING! So happy you get to meet Oprah in person! !